Strolling around the mall can often bring some interesting food discoveries with new food kiosks or exhibits being featured from time to time. Early this year, we discovered the Kashi Maki’s or hand rolled cakes from My Pink Wasabi in Trinoma Mall. A few weeks ago, Ally and I stumbled into a cheap but tasty thrill at SM North Edsa, the Moshi Manju Korean Cakes. My niece was contemplating on trading her acoustic guitar in favor of an epiphone sheraton ii so we decided to go to the music store and get an actual feel of it. As we were exploring the mall for music stores we chanced upon a kiosk that offers Korean Cakes. It was something new for both of us so we decided to try it out. They were bite sized cake that tasted like pancake with custard filling inside. The cake was soft and not too sweet which makes it a perfect match for their sweet fillings. They had two flavors available, the Pastillas de Leche and Chocolate. I may be a chocolate lover but I found the Pastillas de Leche to be the better filling for these cakes. At Php16 for 4 pieces, these bite sized snacks are a steal! 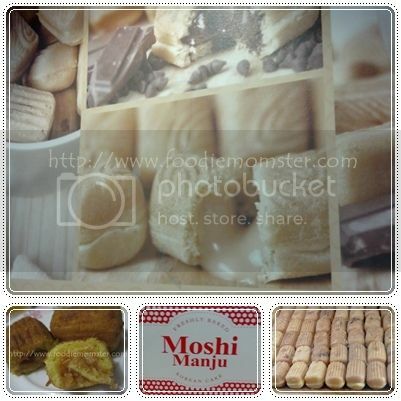 The Moshi Manju is great for students who have big appetites like my niece or foodies who love snacking on a budget. I got myself a four-piece pack to munch on while strolling while Ally got one small pack of each flavor.